Trail description: The Millerground walk may be one of the shortest trials around Windermere, but with fantastic access to stunning views across the lake and lots of distractions along the way, it’s a great walk for all ages and abilities. 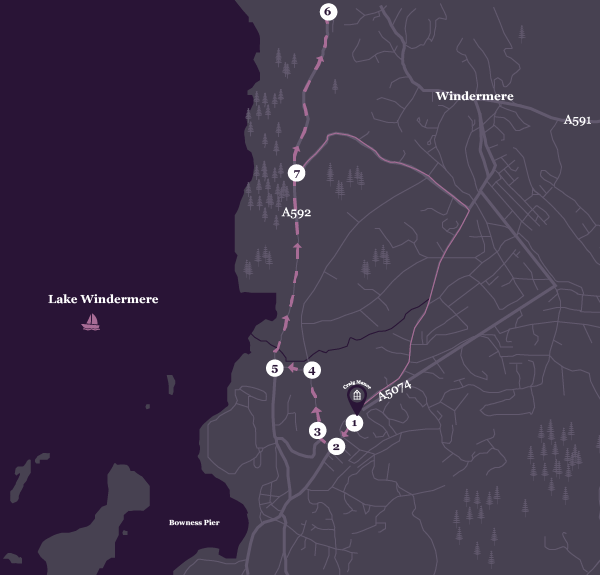 Trail Notes: The walk can take 56 minutes, but we advise spending a good hour relaxing and taking in the great views Windermere has to offer. 1) Upon leaving Craig Manor turn left, heading in a southwest direction on Lake Road. Follow the footpath along the main road (approx. 5 minutes). Keeping close to the pavement make your way down the gentle slope towards the bustling streets of Bowness and past several corner shops. 2) Continue straight along Lake Road until you reach the centre where the road separates with an option to turn right. The streets offer various public attractions, such as galleries, cinemas and cafes to catch your eye as you pass by. Take the turn onto Longlands Road, and a few yards later turn right keeping on route. 3) The path then winds its way uphill before reaching a cross roads. Follow the tarmac surface, which soon turns into a narrow woodland track. As you start your journey, look out for the Bowness Bowling Club to your right with hidden views of the village. When you meet a private road, take the public footpath to your left, marked Rayrigg Road and follow to the A592 (approx.150 yards). 4) This part of the walk is the longest and the toughest. Nearing the end of the footpath you’ll meet a main road. At the A592 carefully cross over and follow the road to the right. Be sure to watch out for passing cars as the footpath exit makes this a dangerous crossing point for walkers. 5) Continue up the long stretch of pavement for approx. 26 mins before reaching a view point car park. Here you’re rewarded with one of the most beautiful views of Lake Windermere. 6) For the return journey to Craig Manor, retrace your footsteps down the A592 taking care to watch for those exiting the view point car park. Keep left to the pavement all the way past the 40mph speed restrictions. Be sure to keep watch for a black gate marked public footpath, as you might walk past your turn off. 7) Turn left following the marked route towards the A591. Keeping to the pavement make your way up the gentle slope and past several village landmarks, including a Victorian style church on the north side of the Windermere village. From here, simply follow the road signs marked Windermere Town Centre back to Craig Manor. For a stunning perspective of Lake Windermere there’s no better place than Hammarbank. This popular viewpoint is just a short walk from Craig Manor, making it perfect for an evening stroll. Bring along a camera to capture the varied colours that are so characteristic of the local scenery. What’s amazing about this view is that it changes every day – if you happen to be passing on a summer’s day the sunsets are not to be missed.